The set contains a brush with bristles as soft as if they were natural, plus a comb with rounded teeth, specially designed not to hurt the babys scalp. Extra soft nylon bristles and rounded edges allow you to use the brush and comb without pulling baby's hair. With a little plastic box to keep them clean and together so they don't get lost. Ideal for storing them in the childs bag or for taking to the nursery. This essential baby brush & Comb set contains all you need to keep baby looking smart and groomed. 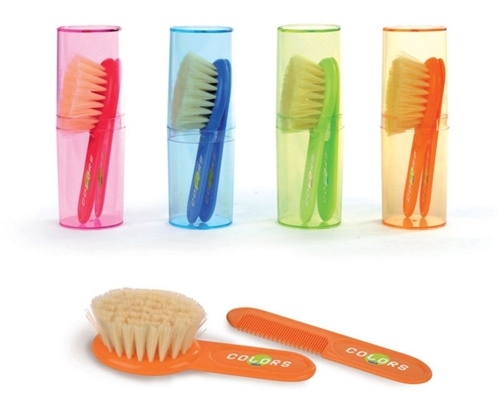 MATERIAL: polycarbonate plastic.Very soft nylon brush bristles, specially designed for baby's delicate skin. Really good for my baby's delicate skin. Would recommend. Lovey, would recommend the set ok.